This is a simple free-standing decoration, made with meditation altars in mind, or as a colourful ornament for brightening up any room. 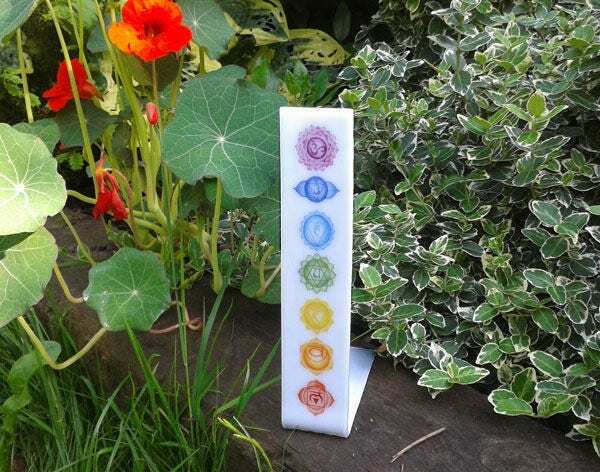 It's made from elegant, white fused glass, with hand-drawn images of the chakras printed onto the glass during firing. It's about 20cm tall and 5cm wide. I'll be making a few of these, so the dimensions will always be slightly different from piece to piece, within half a centimeter or so. Would make a lovely gift for your spiritual friends. Chakras are the energy centres of the human body that help to regulate all its functions; physical, mental and spiritual. There are seven main chakras throughout your body, from the base of your spine to the crown of your head. 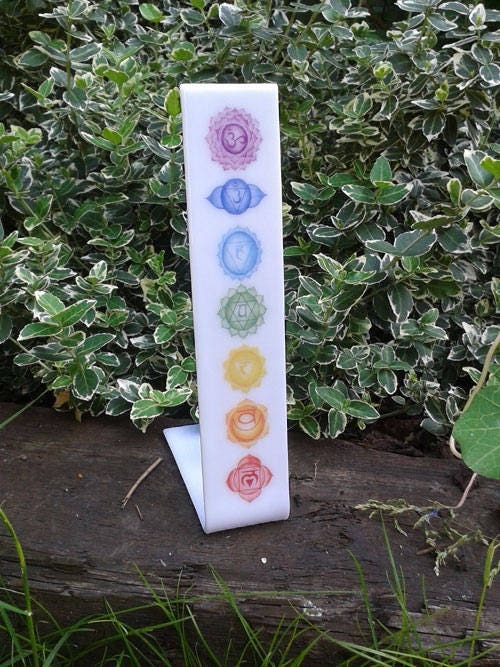 Each chakra has its own vibrational frequency that is depicted through a specific chakra colour. Red - First/Root chakra. Located at base of the spine. Symbolises safety, grounding, and calm stability. Balancing this chakra helps increase physical energy, release fear and is centering and calming. Orange - Second/Sacral chakra. Located right below the navel. Symbolises creativity, fertility, pleasure, desire. Balancing this chakra can unlock creativity, and increase sexual energy and fertility. Yellow - Third/Solar Plexus chakra. Located above the navel. Symbolises our associations with others, and our own emotions. Balancing this chakra can help us navigate our emotions, release anger and stress, and help our ability interact with others. Green - Fourth/Heart chakra. Located in the centre of the chest. Symbolises love in all its forms. Balancing this chakra helps open our awareness of love in the spiritual, personal, and all senses. Blue - Fifth/Throat chakra. Located in the throat. Symbolises communication, and balancing this can inspire one to express ideas, communicate well, and speak one's own truth. Indigo - Sixth/Third eye chakra. Located in the centre of the forehead. Symbolises sight, psychic ability and intuition. Balancing this chakra strengthens these abilities and helps them to grow. Purple - Seventh/Crown chakra. Located on top of the head. Symbolises deep understanding, insight, and connection with the divine. Balancing this chakra is both a function of and result of meditation.